The Presidential Coin of Excellence is given to the most valued of our members. Those who have earned this coin have shown dedication and loyalty to maintaining and maximising all that being a Tactical Gaming member embodies. 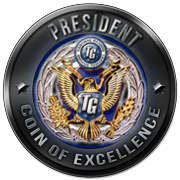 This coin is awarded by the President of Tactical Gaming only and can only be given once per month to the best member inside of the community. The Vice Presidential Coin of Excellence is given to the most valued of our members. Those who have earned this coin have shown dedication and loyalty to maintaining and maximising all that being a Tactical Gaming member embodies. This coin is awarded by the Vice President of Tactical Gaming only and can only be given once per month to the best member inside of the community. 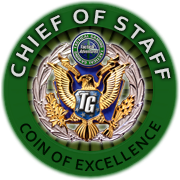 The Tactical Warfare Chief of Staff coin of excellence is given to an individual for dedication, loyalty and success of their Franchise. Members who are awarded the coin of excellence have gone above and beyond their normal duties inside of their Franchise and have shown their focus on growing the community. This coin is awarded by the Tactical Warfare Chief of Staff only and can only be given once per month to the best member inside of the Franchise. 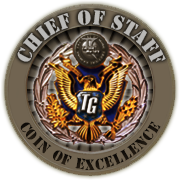 The Tactical Adventures Chief of Staff coin of excellence is given to an individual for dedication, loyalty and success of their Franchise. Members who are awarded the coin of excellence have gone above and beyond their normal duties inside of their Franchise and have shown their focus on growing the community. This coin is awarded by the Tactical Adventures Chief of Staff only and can only be given once per month to the best member inside of the Franchise. 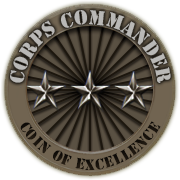 The Corps Commander coin of excellence is given to an individual for services contributing to the success of their Corps. Members who are awarded the coin of excellence have gone above and beyond their normal duties inside of the Corps for the month and contributed to the success of the Corps. This coin is awarded by the individuals Corps Commander only and can only be given once per month to the best member inside of the Corps. The Army Commander coin of excellence is given to an individual for services contributing to the success of their Army. Members who are awarded the coin of excellence have gone above and beyond their normal duties inside of the Army for the month and contributed to the success of the Army. 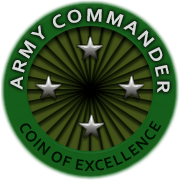 This coin is awarded by the individuals Army Member only and can only be given once per month to the best member inside of the Army. 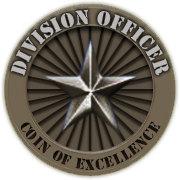 The Division Officer coin of excellence is given to an individual for services contributing to the success of a Division at large. Members who are awarded the coin of excellence have gone above and beyond their normal duties inside of the Division for the month and contributed to the success of the Division. This coin is awarded by the Division Officer only and can only be given once per month to the best member inside of the Division. The Legion Officer coin of excellence is given to an individual for services contributing to the success of a Legion at large. Members who are awarded the coin of excellence have gone above and beyond their normal duties inside of the Legion for the month and contributed to the success of the Division. 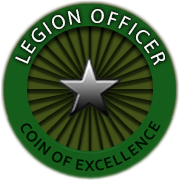 This coin is awarded by the Legion Officer only and can only be given once per month to the best member inside of the Legion. 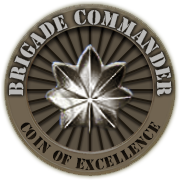 The Brigade Commander coin of excellence is given to an individual for loyalty and dedication to your Brigade. The individuals continued support to the Division Staff team and un-paralleled devotion to the upkeep and progression of the Brigade is appreciated by all. This coin is awarded by the Brigade Commander only and can only be given once per month to the best member inside of the Brigade. The Regiment Commander coin of excellence is given to an individual for loyalty and dedication to your Regiment. The individuals continued support to the Legion Staff team and un-paralleled devotion to the upkeep and progression of the Regiment is appreciated by all. This coin is awarded by the Regiment Commander only and can only be given once per month to the best member inside of the Regiment. The Commanding Officer coin of excellence is given to exploratory members serving on the front line within the battalion. The commitment on the field of play and within your squad is appreciated by both your peers and CoC. This coin is awarded by the Commanding Officer only and can only be given once per month to the best member inside of the Battalion. 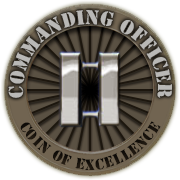 The Cohort Commander coin of excellence is given to exploratory members serving on the front line within the Cohort. The commitment on the field of play and within your team is appreciated by both your peers and CoC. 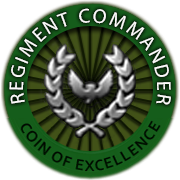 This coin is awarded by the Cohort Commander only and can only be given once per month to the best member inside of the Cohort. The Executive Officer coin of excellence is given to a member who selflessly puts their peers and squad mates before themselves. This member is a figurehead within the Battalion. 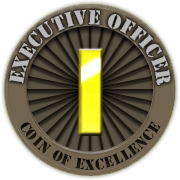 This coin is awarded by the Executive Officer only and can only be given once per month to the best member inside of the Battalion. 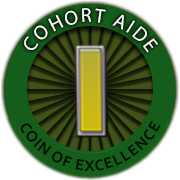 The Cohort Aide coin of excellence is given to a member who selflessly puts their peers and team mates before themselves. This member is a figurehead within the Cohort. 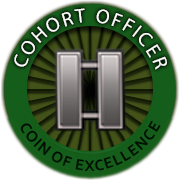 This coin is awarded by the Cohort Aide only and can only be given once per month to the best member inside of the Cohort. 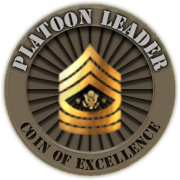 The Platoon Leader coin of excellence is given to an outstanding member for their determination to continuously improve all aspects of their squad. From morale, to forum activity to in game tactics to recruitment. This members efforts ensure the future of TG and improves the TG gaming experience for all. This coin is awarded by the Platoon Leader only and can only be given once per month to the best member inside of the Division. 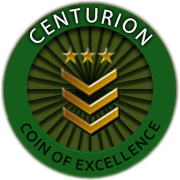 The Centurion coin of excellence is given to an outstanding member for their determination to continuously improve all aspects of their squad. From morale, to forum activity to in game tactics to recruitment. This members efforts ensure the future of TG and improves the TG gaming experience for all. This coin is awarded by the Centurion only and can only be given once per month to the best member inside of the Legion.